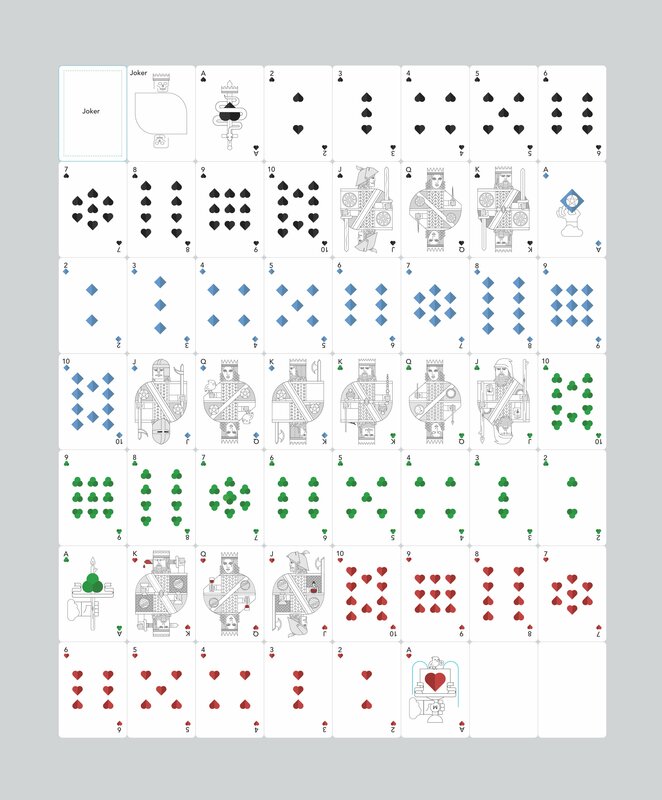 I've been working on a deck of cards. Still trying to flesh out the main theme I want to go for but right now its sort of based on Tarot cards. Spades, Clubs, Hearts, and Diamonds are also Swords, Wands, Cups, and Pentagrams respectively like in a tarot deck. There's also 4 colors instead of 2. The idea is for this deck to also be the minor arcana of a tarot deck and later I can design a "major arcana expansion" deck that when combined with this deck would make it into a full tarot deck. The major arcana card in a tarot deck are the ones with names like "The Magician", "The Fool", "Death", "Justice", etc. The minor arcana are the 4 suits with the Ace, 2-10, and the court cards so that would be this deck. Maybe even will include a couple Major arcana as the Joker cards. Like "The Fool" and "Death" cards since most playing card decks have 2 jokers anyways. I'm also playing around with a duality idea of each of the court cards having slightly different sides. One being normal and the other side being a bit rough or unkempt. This would make them not perfectly symmetrical which would also be good for using them as Tarot cards since a card being upside down means something different than if it is turned right side up. 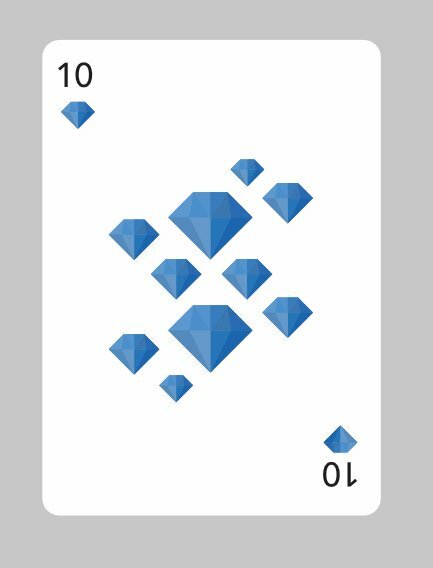 Most number cards can show upside down except for the diamonds so I still need to figure out that for the 2-10 of diamonds cards. Anyways, I'm rambling on now. So what do you think? Any critiques or suggestions on the design? 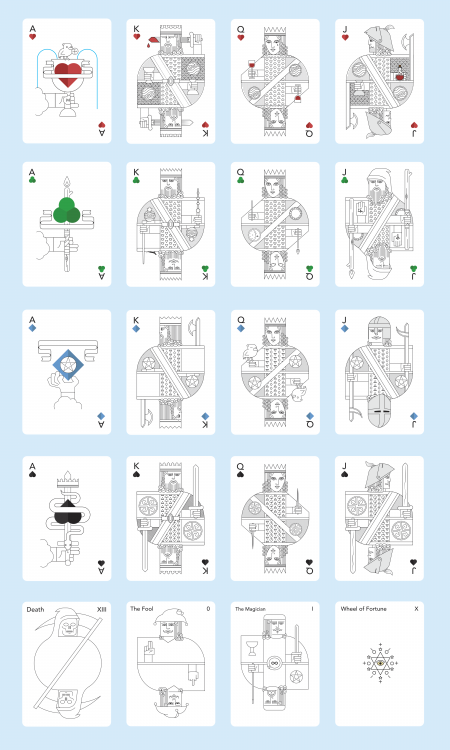 TL;DR - I'm designing a deck of cards. What do you think? The detail on the court cards is very nice - especially the way that the two halves are different and not just flipped - and I like the way you've grouped the symbols on the '7' cards. The use of two/three shades of colour for the suit 'pips' works well too. * The Spades and Hearts symbols need to be different from each other. I realise that they are a different colour but the shapes - regardless of colour - should be easily differentiated (what if someone is colour-blind?). * I don't know about Tarot but to use these as a normal pack of cards you need to have two colours, traditionally red and black. If you have four colours then, if someone is using them in a normal card game - e.g. solitaire, how do they know if green goes on blue or red or black? * I think the card value text needs to be larger in size. It's just a personal thing but the text seems a little small to me. * Only the Hearts court cards have an extra 'splash of colour' in them. It might be nicer if the same is true for all of the suits. All that said, it's shaping up to be a lovely set of cards. It will be interesting to see what you come up with for the card back artwork. Cool! I've been wanting to do a similar thing for years, nice to see someone tackling this. It'll make a nice set of portfolio work. Good point about the the Spades and Hearts. I'm definitely going to add something to the spades to differentiate them better. Never thought about how this would affect playing some games. I like the idea of 4 colors and actually got the idea from playing online poker back in the day and it was using a no-revoke deck. I'll have to think about this one some more. Yeah he's flipping the bird. I just thought it was funny and it's subject to change. The text right now is basically a placeholder. I've been messing with different fonts and such but haven't focused too much time on the letters yet. Will definitely make them larger thought. Yeah I'm on the fence about how much color I'd like to add. Sometimes I think I'll only use the suit color for the respective court cards and other times I think I should color them in completely. The hearts court cards having red color in them was me testing out that idea. This is interesting: I read about how animators typically give characters 4 fingers instead of 5 because for some reason 5 fingers on an animated character tends to look weird. I might redo the hands on the court cards to have 4 fingers. The article I read is here and there's also a youtube video you can watch about it in the article. I actually did have a hard time trying to get 5 fingers to look ok in the current design so maybe 4 will be easier and better looking? 2. A four-colour deck looks nice and can help in certain situations but it could cause confusion in other situations. It all depends on how you expect the deck to be used. If it is specifically for something like poker then it's fine - as long as people know in advance - but if it's for more general use then the four colours may be a problem. (Of course, If you aren't getting them made into actual physical objects then you can do anything you want.) There are all kinds of ways to differentiate between 'red' and 'black' - different background colour, different foreground colour, special markings, etc. - so there are lots of options. 3. In mediaeval Britain the jester - or joker - was allowed to do or say anything to or about anyone - even the monarch (up to a point) - without repercussion so a rude hand gesture wouldn't be out of place. I thought it was funny when I spotted it and thought it was a nice touch, a bit like an 'Easter egg' for playing cards ("Hang on... what's this cheeky little fella' doing?"). My only concern was that keeping it in might limit the audience for the deck as it might not be considered, by some, as appropriate for children. 4. One thing to consider about the text is that a lot of people will be viewing the cards 'in a fan'. The text needs to be large enough for people to easily see what the value is but, at the same time, it needs to be small enough that the player can discern the value while the cards are 'in a fan' in their hands (or when they're peeking at their tops when the cards are face down). For example, imagine the cards in your first image set in a fan. The "The Fool" and "The Magician" cards will be fairly indistinguishable in this configuration as the player will only see "The" and maybe a bit of the shoulder of the character. Tricky to get this right in all cases. 5. I would personally prefer to see a splash of colour on every court card. Not only does it make the design a little nicer but, if the colour was limited to the suit, it gives the eye something important to focus on. I think the small splash of colour might suit this design better than colouring them in fully but I could be wrong. With your obvious skill I'm sure they would look great fully-coloured. All-in-all, please feel free to ignore me - in part or completely - as they are your cards and you can absolutely do with them as you please. I give my comments/advice/opinions only in the hope that I can help to improve the end result, if possible. 2. Yeah. I'm gonna think more about this 4 colors before setting it in stone but I'm leaning towards keeping it 4 colors. 3. That's a great point I didn't think about. Thanks! 4. Totally agree. Will consider this when spending time finalizing the text. 5. I'm going to give them all a splash and then decide if I want to try coloring further to see how it looks. Coloring is a whole other thing after the line work so we'll see how that goes. 6. I think you're right about the 4 finger route. I drew up some 4 fingers hands last night and didn't like them. I asked my girlfriend which she preferred and she said the 5 finger looked better so I'm gonna keep the 5 finger hands. You're right that just because it was useful for animation doesn't mean it's useful in all situations. Even some animated shows have 5 fingers and it looks fine. I've been playing around with pip arrangements for the number cards. The last row in the picture is really rough. That one is me trying to experiment with an asymmetrical layout of the pips and also have different sizes. The rest of the rows are variations of cards that probably already exist in some form. Row 4 is essentially the layout a deck of bicycle cards has. 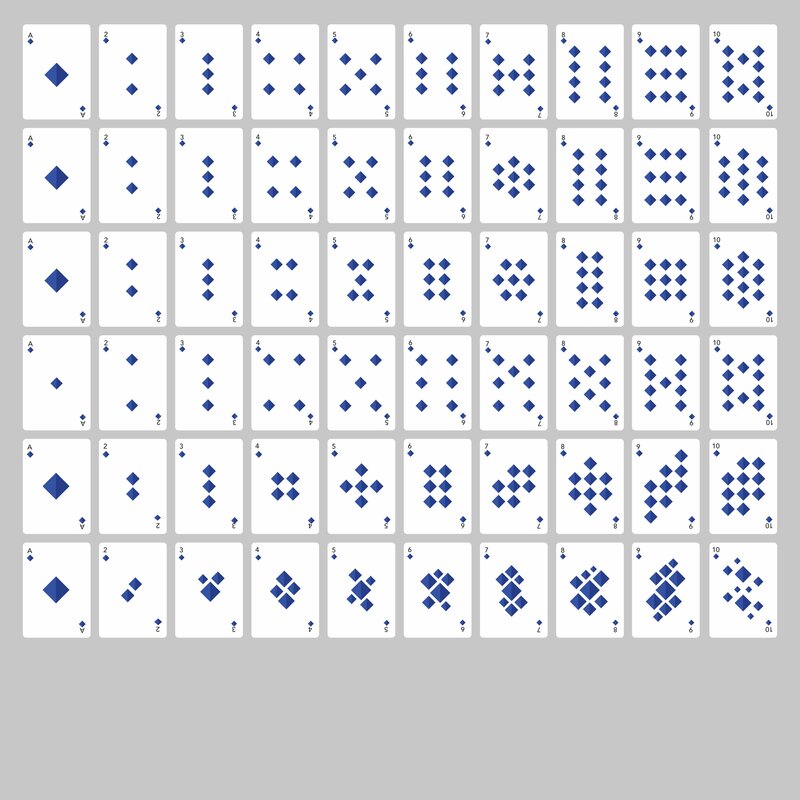 Rows 1-3 are just something I quickly came up with when trying to keep the pips symmetrical and on a grid. I'm leaning towards trying to make the last row style work since the asymmetrical aspect of it would make it easy to tell the top from the bottom of the cards. Being able to tell if the card is "upside down" would help with them being used as a tarot deck and also be fine for regular card games. 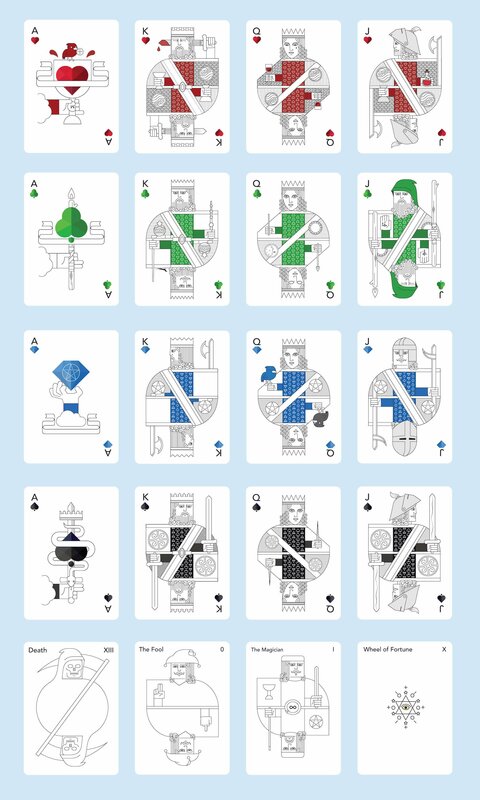 Heart, Spades, and Clubs are pretty easy to show upside down but the Diamonds are symmetrical so trying to portray them upside down would need something like the last row in the picture to convey. Or I could change the Diamonds shape to being asymmetrical too but I'm not sure I'd want to do that. I'll stop ranting now.... Lol. Of the last set, my preference is for row 3. I've looked at tarot decks, but never used them. I've only known 2 people who ever did, so I don't know if the effort on row 5 would have much response. My only divinatory use for cards is a couple rounds of solitaire in the morning to tell me if I should drink some more coffee, or maybe just pile back into bed. A suggestion. Some decks have the pips within a border.  A border could be made variable, and thicker/thinner to show top and bottom. Likewise, if you wanted to inject some color beyond red & black the boarder could have that. But I fear I don’t get the 7 and the 10 in row two and row three. I find myself counting when I look at these configurations, and I am not sure if that should be the case. No need to add that the last row requires a lot of counting too … LOL … so from a functional perspective, I would opt for row one. Well, that’s boring, I know. I kind of figured people wouldn't have to count since they'd default to looking at the number in the corner anyways and that meant the pip arrangement could be more creative rather than functionally quickly countable. Before there were numbers in the corners of the cards that was definitely more important. Just my line of thought as to why I'm trying some different arrangements. I would opt for row four with its traditional arrangement of the pips, although you could probably get away with slightly enlarging the pip in the centre of the ace. You can be as creative as you like with the court cards (within reason!) 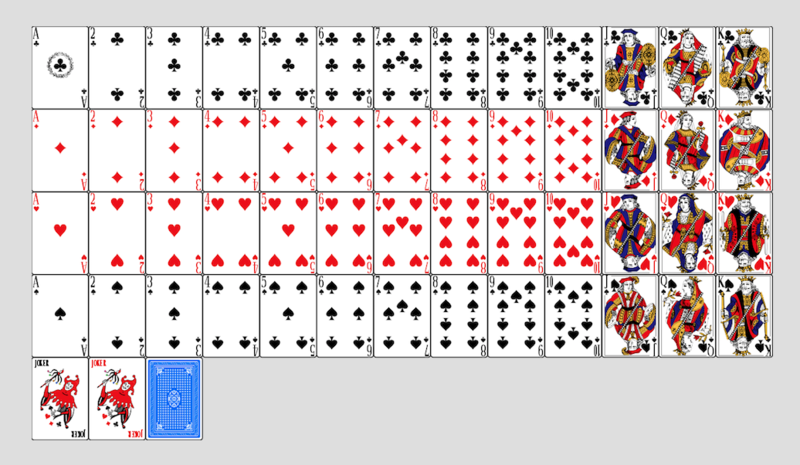 but for the face cards an unconventional pattern just gets in the way. 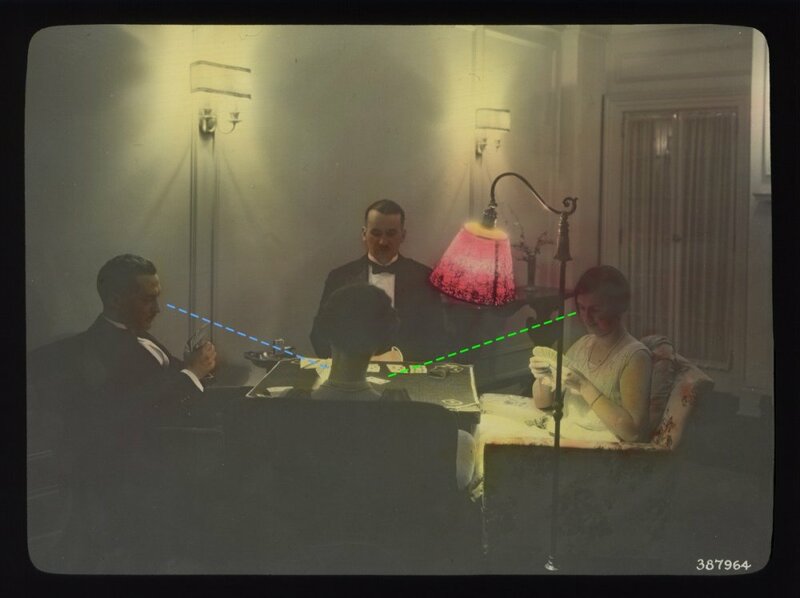 I must confess I haven’t been playing cards for a while, but a quick research showed me that there are actually very different arrangements for the pips. I grew up with something like the French arrangement, and this one is obviously the one that resembles the first row most closely. Just the 9 is different. It is really hard for me to see an 8 in the fourth row. This configuration makes me count. But this is obviously the arrangement that Alfred is accustomed to. So maybe there should be different decks for different countries? The 6 is three rows of two columns each, and the 7 is the same with one extra pip in the middle. Is it really so hard for you to see the 8, Alex? It’s just like the 6 and the 7, but with two pips in the middle instead of none or one. 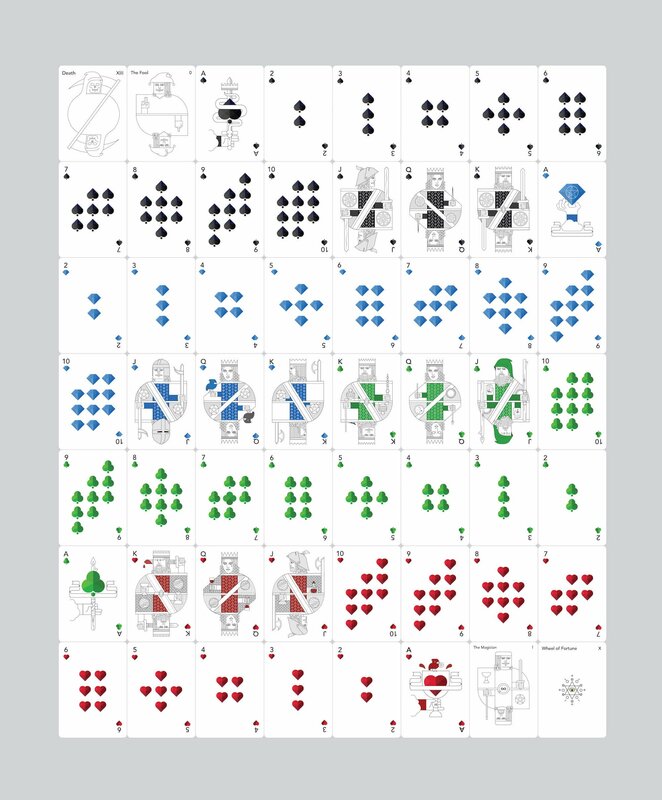 I wonder if the ease of counting the pips is actually important when there's already a number in both corners to tell which card you're holding. Most of the time, Someone is holding their cards in fanned position to read just the corner number. I figure since this is the case I could be more creative with the pip arrangement instead of worrying about ease of counting. If a lot of people disagree I would consider making it more "countable" but I'm not sure I'm convinced to go that route at this point. It’s not that I could not figure out that number, Alfred … LOL … when say that I cannot “see” this number at first glance, I am talking of a learned, and obviously very deeply ingrained, recognition pattern. Maybe I should have better said that I cannot “read” this pattern at first glance. It is much the same as if I had to learn a new script, such as Cyrillic. I would have to start with spelling out the words, letter by letter, and in the same way I find myself spelling out the arrangement of the pips on the 8 of row four. I wonder if the ease of counting the pips is actually important when there's already a number in both corners to tell which card you're holding. But you must have in mind, that cards are not only held, but they also have to be played. And this is the crucial situation. One must be able to determine at a glance which card has been played. And so from a certain distance. I doubt that a little number will suffice then. It's worth keeping in mind that card games can be shared by people who don't have a similar culture. Think of sailors waiting in port for their ships to be (un)loaded and having a game. They can speak different languages and have different numerical systems but they can both recognise what the cards are from the number of pips and the pictures on the court cards, E.g. 1 pip, 2 pips... 10 pips, young man, lady, old man. As long as you understand that progression you can play the game even if you don't speak the same language (as long as you are playing by the same rules of course). It's also worth noting that the pips can be used to teach people - not just children - basic numerical skills, E.g. 2 pips plus 3 pips equals 5 pips, take 3 pips from 9 pips and you're left with 6 pips. Count the pips and build up a knowledge of simple addition and subtraction. Personally I think that arrangement makes it a bit difficult to see some differences at a glance, especially for the numbers greater than 6. I really like the latest idea from @jimmyplaysdrums with the diamonds. Every arrangement is different and quickly discernible from the others. I would have to learn the arrangements again because I was already used to the other way but I think it's an improvement on what I have come to know as the standard. I'm not entirely sure about having different sizes of pips on the same card but maybe it makes the arrangement easier to fathom. There's a good chance that it looks weird to me because that's just not what I'm used to. Just because I'm used to it doesn't mean it's the best way. It would be interesting to see how it would work in the real world, the best way to see if something really works. It’s﻿﻿ n﻿ot that I could not figure﻿﻿﻿﻿ out that number, Alfred … LOL … when say that I cannot “see” this number at first glance, I am talking of a lear﻿ned, and o﻿bvio﻿usly very deeply ingrained, recognition pattern. Maybe I should have better said that I cannot “read” this pattern﻿ at first﻿ gla﻿n﻿c﻿﻿﻿e﻿. I didn’t think for a minute that you couldn’t figure out that number, Alex! I was just a little surprised that you find it difficult to see/read. Like Garry, those patterns are the ones I grew up with. Having said that, I don’t think the French pattern for 8 would particularly faze me: using the pattern for 9 with the middle pip removed seems just as logical and accessible as using the pattern for 7 with another middle pip added. You're absolutely right. The pip arrangements aren't for the holder of the cards. They're for the other players to quickly see from afar. Thanks for pointing this out! I worked on the Pip design. They're a little more geometric and I kinda of like it. Started adding some color to the court cards. Arranged all the other pips the way I did the the diamonds to see how they all look. Few of the court cards and Ace's got updated with some new details. Still lots to do but I feel like I'm making some progress!